next post: The plaintive, I just want to do my art! I was thinking about this topic again today as tonight I am speaking at a Politics-in-the-Pub event in Newcastle on UBI versus Job Guarantee. Well the topic I was given was the ‘advantages’ of a UBI. But, I indicated I would only accept the invitation if the broader issues were included including the superiority of the Job Guarantee as a buffer stock price stability mechanism. One of the major characteristics of the neoliberal period has been the abandonment or rather perversion of the concept of full employment. Even so-called progressives claim we have moved beyond a time when everyone who desires a job can have one and so they – in neoliberal surrender mode – think they are being innovative by advocating a basic guaranteed income solution. The CEOs from Facebook, Tesla, Virgin and Slack among others are also calling for a BIG. Curious that. The progressives cosying up with the oligarchs. These oligarchs suppress wages and working conditions but they are apparently starting to realise that the deregulation that has impoverished millions of workers and improved their company bottom lines is also undermining the ability of consumers – yes workers earn wages and then consume them – to buy all their fancy products. Solution – give these characters a minimum income to keep them consuming. Never mind about their dignity as workers etc. I have found it strange that progressive Left types and Greenies have got cosy with these free market business oligarch types (who actually don’t like free markets in general, just the bits, like occupational health and safety standards, that impact on their bottom line). The progressives say – just because the CEOs like it doesn’t mean that it is a bad idea. Really? The next word that comes to mind is ‘naivety’. The next two ‘in spades’. The motivations of the CEOs in this regard is not to create sufficient, well-paid jobs. They don’t want governments to use there fiscal capacity to ensure there are enough jobs. They just want to maintain people who are being left behind as ‘consumption units’ to make sure they can keep buying their stuff. But even then that doesn’t work because the sort of BIG stipends they propose are too low for mass consumption to continue without further credit expansion. That lock-in, vicious cycle – suppress real wages and employment, push credit onto workers instead to maintain consumption, bankruptcy, house loss, crisis, public bailout, continue – is the exemplar of the neoliberal period. Privatise the massive speculative gains while they are there but when the whole show collapses turn to government for the bailout, just to start again. So with realisation crises becoming more frequent, the neoliberals turned their attention to new ways to create surplus value and profit. The BIG push from the CEOs is part of that narrative. They are mountebanks not progressive saviours. Given they will use all their influence to lobby outcomes that perpetuate the trends they think will benefit their vested interests, how can so-called progressives think, for one minute, that a BIG will launch a new era of liberation for creative spirits? And if, perchance the people rise up and start to reverse the neoliberal onslaught of societal oppression, to demand better working conditions and wages as well as a BIG, then why wouldn’t they also demand an end to the era of austerity-created mass unemployment? Which would then militate against one of the basic motivations (and lies) that are advanced for the BIG – that there will never be enough jobs to go around so an alternative avenue to income distribution (the BIG) must be implemented. 1. Basic income guarantee progressives cosy up with the worst CEOs in the world (April 4, 2018). 2. A basic income guarantee is a neo-liberal strategy for serfdom without the work (April 5, 2017). 3. Why are CEOs now supporting basic income guarantees? (March 28. 2017). See other entries under the – Job Guarantee – category of my blog. To summarise (and see the blog post US labour market reality debunks mainstream view about structural impediments (January 15, 2018) for more detail), dynamic efficiency arises when when cyclical upgrading gains are enjoyed as a result of the government establishing high pressure labour markets – that is, true full employment. The evidence is that when the economy is maintained at high levels of employment, workers in low paying sectors (or occupations) also receive income boosts because employers seeking to meet their strong labour demand offer employment and training opportunities to the most disadvantaged in the population. If the economy falters, these groups are the most severely hit in terms of lost income opportunities. Upgrading also focuses on the mapping of different demographic groups into good and bad jobs. The groups who experience the greatest relative employment gains when economic activity is high are those who are stuck in the secondary labour market, typically, teenagers and women. While these groups are proportionately favoured by the employment growth, the industries with the largest relative employment growth are typically high-wage and high-productivity and employ mostly prime-age males. Expansion is therefore equated with ladder climbing whereby males in low-pay jobs (as a result of downgrading in the recession) climb into better jobs and make space for disadvantaged workers to resume employment in their usual sectors. In addition, favourable share effects in predominantly male industries provide better jobs for teenagers and women. So there are many benefits from growth which spread out across rising participation, rising wages, rising hours of work, rising employment and falling unemployment. This is the prima facie reason why governments have to do everything they can to prevent a recession from occurring and quickly moving to stimulate an economy where non-government spending is faltering. This also relates to the concept of a skills shortage and structural mismatch, where the requirements of available unfilled jobs do not match the available skills of the unemployed. Unsurprisingly, analyses of skills shortages by industry and governments invariably consider the issue from the perspective of business and profitability, which places the emphasis on containment of labour costs both in terms of wages and conditions, and hence, whenever possible, externalising the costs associated with developing the skills firms require in their workers. Within this context the notion of structural unemployment arising from so-called ‘skills mismatch’ can be understood as implying an unwillingness of firms to offer jobs (with attached training opportunities) to unemployed workers that they deem to have undesirable characteristics. Indulging in prejudices against this and that cohort is easier when there is mass unemployment. There are plenty of idle workers to choose from and firms can pick and choose at will. When labour underutilisation is high, firms can easily increase their hiring standards (broaden the desired characteristics they demand from workers) and the training dynamism driven by labour shortages is lost. Then we observe, in a static sense, ‘skill mismatches’ which are really symptoms of a ‘low pressure’ economy. But, when the labour market is tight, the willingness of firms to indulge in their prejudices is more costly. If vacancies run ahead of the available labour, then firms have to scramble to get labour and offer training with job slots to keep their enterprises functioning. Thus, one of the advantages of maintaining full employment is that it introduces a dynamic efficiency into the economy. Firms have to be continually offering training and skills development as they create new jobs because otherwise they will not maintain market share. Workers are molded to the needs of the job with appropriate skills on an on-going basis. Firms cannot afford to indulge in irrational prejudice. Disadvantaged groups rise with the tide. And finally, this also bears on the advantages of introducing a Job Guarantee. While conservatives are continually extolling the primacy of market forces, they actually express a fear of letting market forces work when it comes to providing advantages and opportunities to the most disadvantaged workers in our communities. The critics prefer to keep this disadvantaged cohort suspended in a void of joblessness and cycle them through clearly irrelevant training programs. They seemed to distrust the ability of the private sector to structure interesting and attractive jobs to lure workers away from Job Guarantee positions. Remember, that the Job Guarantee, which forms an integral part of Modern Monetary Theory (MMT), provides buffer stock employment to anyone who wants such a job at any time at any fraction of a working week. It is an unconditional fixed wage offer to anyone by the Government. That is a very powerful aspect of the proposal as it means the Government ‘hires off the bottom’ rather than the top and can never be a source of inflationary pressure. Further, the private sector can employ the JG workers any time they choose. All they have to do is provide a better ‘market’ opportunity. That would encourage dynamic efficiencies because the incentives would be there in the private sector to improve productivity and on-the-job training to ensure that the wages paid were profitable. Proponents for the introduction of the UBI or BIG fundamentally fail to see the advantages of these dynamic gains. That is why progressives should always be pushing governments to create high pressure labour markets, which we know generate all these spin-off gains to workers, in addition to reducing unemployment. The Japanese labour market is, on the face of it, doing well at present. On the face of it, refers to say highly visible statistics like the official unemployment rate, which is now at very low levels (2.2 per cent in May 2018). 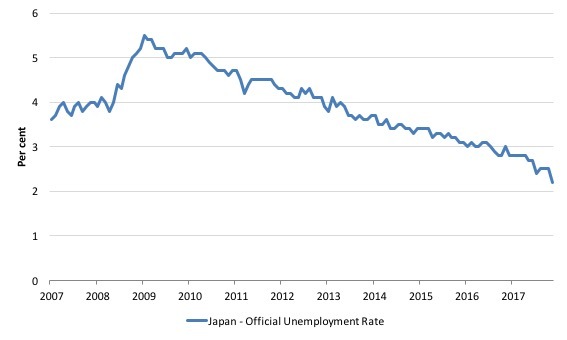 The following graph shows the evolution of the Japanese official unemployment rate since January 2007 to May 2018. One might conclude that the Japanese labour market is near to full employment and there is no doubt, that is certain skilled occupations, there are labour shortages emerging. But two things (at least) tell us that there is still scope for improved labour market outcomes in Japan. The first, which I won’t analyse in this blog post is the fact that wages growth is still subdued in Japan. That is hardly consistent with a very high pressure situation. Second, while the official unemployment rate is low other, broader measures of labour underutilisation present a different picture. For example, in Japan, the labour market is segmented between regular and irregular employment – sort of the division we use in the Anglo world between permanent and casual jobs. Regular jobs come with superannuation and tenure while irregular jobs offer low pay, poor working conditions and precarious tenure arrangements. 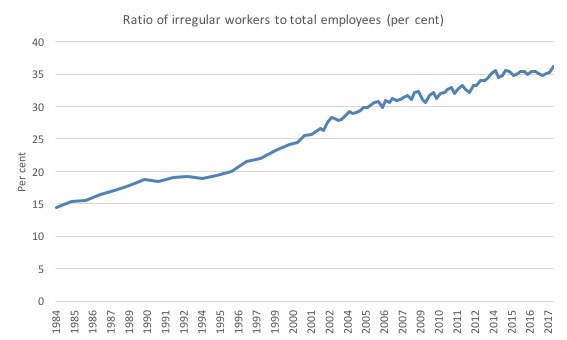 The following graph shows the rise in irregular workers as a percentage of total employees since 1984. Note that up until 2002, the data was annual (February observations), then quarterly observations began in the March-quarter 2002, which explains why the line gets less smooth after that. The point is that there has been a dramatic rise in the incidence of irregular work. Historically, irregular jobs were secondary jobs, supplementing income from the main job. But that situation has now shifted as irregular jobs are increasingly becoming the norm not the exception. While neoliberals (and many economists) claimed this trend was a reflection of choices being made – I guess you have heard about the “work-life balance” story that these characters perpetuated to make this trend seen reasonable – there is now growing awareness that growth rates rely on viable growth in consumption expenditure. Consumption is the largest component of national expenditure and hence GDP. Viable consumption growth must come from real wages growth and not from pushing more credit down the throats of increasingly casualised (irregular in Japan) workers. In Japan, it is clear that the trend to irregular work has undermined consumption growth and will in the future require much higher public retirement support given that only regular workers have access to reasonable pension prospects upon retirement. On January 5, 2016, the Japan Times Editorial – Plight of irregular workers – note dhtat a survey by the Health, Labor and Welfare Ministry on “diversification of employment forms” in Japan, found that many of the irregular workers were part-time (69 per cent) and 11.9 per cent were “People 65 or older”. The latter group are increasing as firms re-employ previously full-time regular workers on lower pay and conditions, once the compulsory retirement age. Businesses in general have been turning more and more to irregular workers as easy-to-hire and easy-to-fire manpower that they can use to fit their needs. The survey also revealed that 48 per cent of irregular workers wanted full-time regular jobs but could not find them. But as labour market pressures mount in Japan, positive impacts in policy development are finally starting to address the problems of irregular work that were overlooked when unemployment was about 5 per cent. The following graph shows the evolution of the unemployment rate in Japan since January 2007 until May 2018 (latest data). The unemployment rate now at 2.2 per cent and it was last at this level in mid-1992 as the massive property market crash began. So it quite a historical moment that economic growth has generated sufficient growth in jobs to bring the unemployment rate down to 25-year lows. The result is that the lack of equity in irregular jobs is now becoming more visible. The Financial Times article (July 4, 2018) – Japan’s long-hours culture is changing regardless of Abe’s bill – reported on the case of a truck driver in Japan who was forced to retire (by compulsory age laws) after working for decades in the same job. The shortage of truck drivers in Japan motivated his company to immediately re-employ the driver under an irregular contract with lower pay and the other benefits he had enjoyed for years missing. The case led to a Supreme Court challenge, which gained some public attention. There have been several recent cases of a similar ilk adjudicated by Japanese courts. This Japan Times article (June 24, 2018) – Two Japan Supreme Court cases clarify when discrimination against fixed-term workers is OK – provides detailed analysis of the cases. June 1, 2018, is a day that will go down in Japanese labor law history. A single day saw two verdicts from two similar cases handed down by the Supreme Court, both based on the 2012 amendment to the Labor Contract Law. The Supreme Court basically ruled that any “irrational disparity between two groups of workers doing the same job” is invalid under the law. The truck company was thus violating the law. Principle 1: The judicial framework set up by the legislators can reverse the trends against workers from the ‘market’. Which is what we argue in our latest book – Reclaiming the State: A Progressive Vision of Sovereignty for a Post-Neoliberal World (Pluto Books, 2017). But there is a further demonstration of how state intervention can deliver progressive outcomes for workers in the face of neoliberal type trends. On June 29, 2018, Japanese Prime Minister Shinzo Abe responded to the growing outcry over the trends towards irregular work and the inequities that arise by getting new labour legislation passed by the Diet (Japanese Parliament). The workplace changes are designed to change the overall culture of the labour market in Japan amidst controversy over whether the correct data had been used etc. Setting a legal cap on overtime work; ensuring equal treatment for regular and nonregular workers; and exempting skilled professional workers with high wages from working-hour regulations. I won’t analyse all the components. The overall result is a mixed bag for workers and progressive groups and unions have clearly been against these elements. I am referring here to shifts in overtime arrangements and the changes to professional labour markets, which may (and probably will) lead to some workers still doing overtime but not being paid at higher rates. There could also be some capital-labour substitution arising from the overtime arrangements as firms further investment in capital to help overcome the shortages of labour in certain areas. But the major progressive element in the legislative package, is that the legislation seeks to reduce the wage and condition differentials between regular and irregular jobs to better improve outcomes for those at the bottom of the labour market. The law guarantees equal pay for equal work and will certainly improve wages for non-regular workers. The truck driver in the case mentioned above was doing exactly the same job the day after he was forced to retire and then rehired under an inferior, irregular contract. While I think the new legislation is not progressive overall, what this demonstrates is that the legislative fiat of the national government can shift outcomes for disadvantaged workers in a favourable direction. We can also see positive changes emerging in the US labour market as lower unemployment rates are forcing firms to change their hiring standards and workers are enjoying better options. The hiring and firing data available from the – US JOLTS database – supplied by the BLS provides some good insights into these processes. The JOLTS data allows us to explore the evidence-base to distinguish whether it is ‘supply-side’ movements that are driving the shift in unemployment (that is, actions by workers) or whethor ‘demand-side’ factors are more influential. For there to be employment there must be spending in the economy and mass unemployment is a sign of deficient spending. Firms create employment in response to demand for their products. They might be confronted by millions of hungry unemployed workers but they still won’t put them on because there is insufficient demand to justify expanding production. I provided some detailed analysis of this effect using Unemployment to Vacancies ratios in this blog post – US labour market in an uncertain limbo (September 8, 2016). In this blog post, I want to concentrate on quit rate behaviour, which also allows us to assess whether the decline in the unemployment rate is being mostly driven by demand-side or supply-side forces. Remember that the mainstream text book economics view is that the supply-side dominates as workers exert their free choices between labour and leisure. The supply-side story starts with the textbook model of the labour market which claims that employment and the real wage are determined in the labour market at the intersection of the labour demand and the labour supply functions. The equilibrium employment level is constructed as full employment because it suggests that every firm who wants to employ at that real wage can find workers who are willing to work and every worker who is willing to work at that real wage can find an employer willing to employ them. Frictional unemployment is easily derived from this Classical labour market representation, as is voluntary unemployment. Holding technology constant, all changes in employment (and hence unemployment) are driven by labour supply shifts. There have been many articles written by key mainstream economists (such as Milton Friedman) that argue that economic cycles are driven by labour supply shifts. The essence of all these supply shift stories is that the quit rate is constructed as being countercyclical – that is, rise when the economy is in decline and vice-versa – despite all evidence to the contrary. I discuss the theory in more depth in this blog post – US labour market in an uncertain limbo (September 8, 2016). The strong mainstream prediction is that quits will fall as employment falls. The simplest fact then, which would give support to this notion of supply-side shifts, is whether the quit rate is, indeed, counter-cyclical – as the theory predicts. That is, does the quit rate rise when the unemployment rate rises or not. Simple enough. The US Bureau of Labour Market JOLTS database includes estimates of the quit rate. 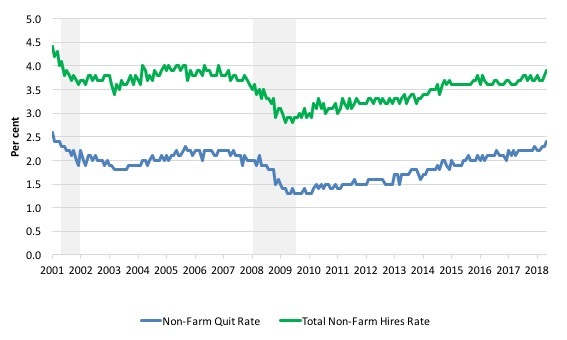 The following graph shows in a compelling way that the quit rate (non-farm quits as a percent of total non-farm employment) behaves in a cyclical fashion as we would expect – that is, it rises when times are good and falls when times are bad. The graph – for the period December 2002 to May 2018 – relates the quit rate (vertical axis) to the unemployment rate (horizontal axis). The straight black line is a simple linear regression trend drawn through the graph. There are no shifts evident in this relationship just movements along a fairly defined inverse relationship. That is, when the unemployment rate rises, the quit rate falls. Exactly the opposite to that predicted by the supply-side story which means that their claim that causality runs from unemployment benefits to higher quits to higher unemployment is unsustainable. Many studies, which are not caught up in the orthodox Groupthink, have demonstrated the phenomenon depicted in this graph – for several countries where decent data is available. Workers become very cautious when unemployment starts to rise and postpone any desired or planned job changes and opt for the security of their present job. When there are more jobs being created and the hiring rate rises, workers then take more risks and the quit rate tends to rise. Quits are procyclical, rising during an expansion and falling during a contraction … As of 2014, quits had not reached prerecession values in most industries. While some industries recovered fully to surpass 2007 values, overall, the annual quits level was 88 percent of its 2007 level. The next graph also provides supportive evidence of this pro-cyclical quit behaviour. As the hiring rate rises (labour demand increasing), the quit rate also rises. By May 2018, the quit rate of 2.4 is now above the pre-crisis peak of 2.3 and has been on the rise all yaer. The following graph shows the total number of unemployed per job opening (non-farm and seasonally adjusted) and thus gives a measure of how strong the demand-side of the labour market (job openings) is relative to the number of people seeking work (the unemployed). It is an alternative way of presenting the relationships between unemployment and vacancies. The shaded area indicates the NBER recession months. The job openings and unemployment levels generally move in opposite directions. During a robust economy, job openings are high and unemployment is low. During an economic contraction, the dynamics reverse — unemployment rises, while job openings fall. 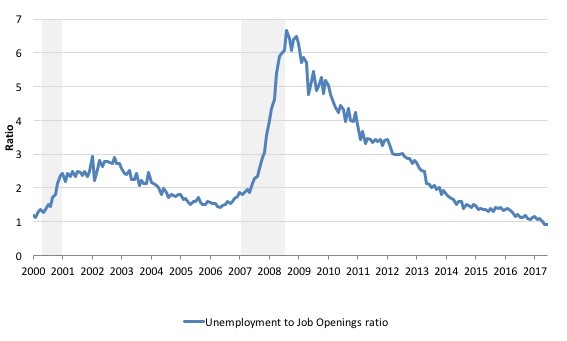 Accordingly, the ratio of the unemployed to job openings provides a metric that helps describe the state of the economy … Since July 2009, 1 month after the end of the recession, this ratio has trended downward. In January 2014, the ratio stood at 2.6. By December 2014, it had fallen to 1.8, the same ratio present in December 2007, the start of the recession. In May 2018, the ratio stood at 0.9 meaning that there are now more job openings than unemployed. This is when the dynamic efficiency benefits starting emerging. Labour markets typically behave over the business cycle in an asymmetric manner as can be seen from the graph. The deterioration was sharp and rapid. The recovery is much slower and is all the more slow as the employment growth not only has to absorb new labour force entrants (arising from population growth) but also has to face the huge pool of unemployed that is caused by the recession. One of the facts I repeat often is that the unemployed cannot search for jobs that are not there! This is exactly what happens when aggregate demand falls and job openings dry up. But when vacancies start outstripping the available workers the dynamic benefits flow. Wages start to rise, firms start to offer on-the-job training to absorb less-skilled workers, hours of work rise (so underemployment falls), productivity rises, etc. Another way of seeing how the job flows tell us about the direction of change is to compare movements in hires and separations. The following graph shows this relationship for the US economy as published by the BLS for the period from December 2000 to May 2018. While labour markets are clearly dynamic in the sense that even in a downturn new jobs are being continually created and destroyed the rates of each dynamic change in a cyclical way. So while there were new jobs being created at the height of the downturn there was a severe shortfall of new jobs emerging as is shown in the graph. Separations also fall for reasons noted above. The difference between hires and separations is the net change in employment in each month. 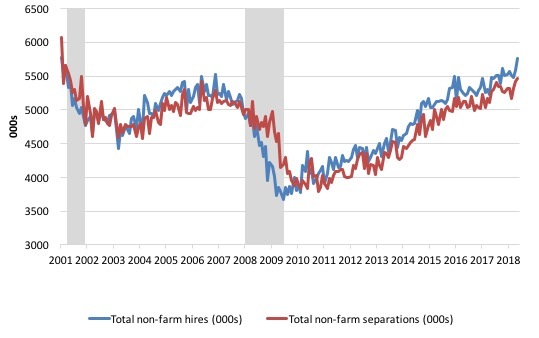 If hires outstrip separations, employment grows and vice versa. The most recent data shows that hiring and separations have started to rise again after stalling towards the end of 2017. Further, the layoff and discharges rate also published in the BLS JOLTS database which reflects the demand-side of the labour market is also firmly counter-cyclical as we would expect. Firms layoff workers when there is deficient aggregate demand and hire again when sales pick-up. Again this is contrary to the mainstream text book logic. The last graph shows job openings and unemployment from December 2000 to May 2018 (in 000s). 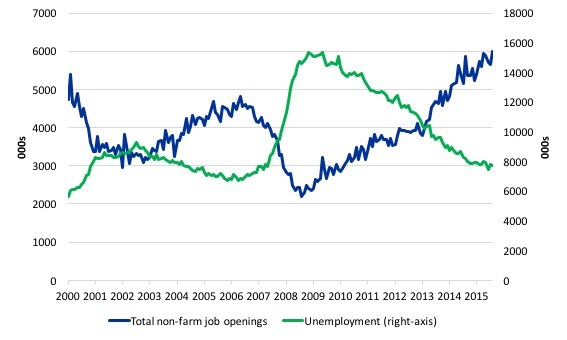 Total unemployment (green line) is on the right-axis while total non-farm job openings (blue line) are on the left-axis. As the economy faltered, job openings collapsed and unemployment rose but not as much as would be predicted by the employment losses. Why? Answer: Some workers gave up looking and left the labour force. As the job openings increased again in recent months, unemployment has been steady because the discouraged workers are now re-entering the labour force again. This is accounted for by the significant fall in the US participation rate that is independent of demographic factors such as ageing. 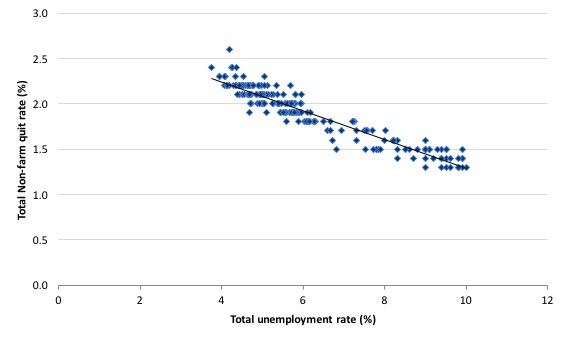 All the evidence supports the conclusion that deficient demand not only increases unemployment in the downturn but also pushes people out of the labour force as they give up actively looking for work that is not there. These hidden unemployed workers re-enter the labour force as the probability of getting a job (in their mind) increases. The point of all this is that establishing high pressure labour markets brings about more than just workers who want to work having jobs. It brings other major benefits that workers can enjoy and forces firms and governments to manage their affairs differently from when there is entrenched unemployment. The UBI proponents never really understand that point as they continue to surrender to the proposition that mass unemployment is inevitable and all the governments should do is keep people alive with some guaranteed income. All these dynamic efficiency gains are then not realised and capital has the run of the field. The time to implement a JobGuarantee is now when economies are getting stronger. Because it’s a preventative tool. It absorbs newly laid-off workers and slows down the snowball/accelerating unemployment effect from recessions. To launch it in the midst of a crisis would be missing the boat. One of the biggest scams of the modern era was the introduction of agencies that replaced the historic role of unemployment centres. Which just opened up the oppertunites for fraud. The agency workers get paid less than other people who are doing the same job. Should’nt that be: ‘quits will rise as employment falls’ or ‘quits will fall as unemployment falls’? Both of which are countercyclical. When the system is designed against the workers it is quite a challenge to reverse unemployment. And to conclude “In other words, there are many areas of public expense that do not have a direct market productive value but we value all the same”, page 83, Basic Income and the Left An European Debate, Philippe Van Parijs. The Ceo’s and oligarchs seem to have a truly twisted and bizarre vision for the world, one were fiscal policy is decided by the combination of banks, large corporations and consumers rather than democratically responsive governments. I fear most of the oligarchs have lost their sanity; that is what comes of being so completely detached from the conditions experienced by the rest of society. The UBI idea is going to be tough to kill because a large number of people now weary from trying to live on income from awful jobs find the idea of similar money for less or no such work appealing, as do many others, especially the young, who believe it would free time to follow their creative pursuits; and, the politicians are testing the waters already. The Ceo’s had better be careful what they wish for; from the standpoint of the corporate bottom line as well as a vibrant, living, real economy, the job guarantee is clearly the wiser choice. “Job Guarantee is superior to Universal Basic Income .. ” why would that be. Job Guarantee is a reductionism. Is sweeping public parking lots superior to art on a wall? Is compulsory cleaning of hospital wards superior to self-publishing ones poems? Marcel, there’s no reason why an artist or a poet would be forced to sweep parking lots under a job guarantee. It’s a guarantee, not a compulsion. Matt, IRL there are many ‘job guarantee’ pilots already in place where, like in the Netherlands, any one without a job who get’s paid out dole, is required to ‘participate’ in society ‘to not lose touch with job experience or human interactions’. For their own good of course (of course), and this might look acceptable on paper but whitepapers written by union researchers give ample proof of the contrary, of which I gave examples of what then actually is being regulated, though color of law and intimidation. Local ’employers’ are given ‘slave’ labor to clean the parks, collect garbage, like the penal system in the USA punishes criminals, to ‘maintain work experience’ . ‘Job guarantee’ is what it becomes in the hands of administrators. It’s reductionist and sadistic malcontentment waiting to happen, per the usual. ‘Job guarantee’ is semantically related to ‘work force’ where the moguls of Silicon Valley already understand that through the automation that is coming, and by merely looking around to see what the USA category of ‘useless eaters’ and misfits is left to do, they know they want these homeless, the rambling uneducated, the unwashed and all the misfits of their sidewalk in their LA and San Francisco. Not by ‘giving’ or ‘creating jobs’, but by having a new industry of administrators give these something to do. Which is reductionist. People who have become superfluous to the requirements of business and commerce, should be given ample opportunity to decide for themselves what to do with their vitality and not be destined to clean streets unless for a competitive commercial wages that are fully sustainable. @prof bill mitchell – Can you please post the link to the source data of the ratio of irregular workers to total employment graph? You mean paying people to vandalise and be public nuisances? There is a need to encourage the production of “value”, that is the mutual recognition of a “good” having been produced. That is the price for continuing general support of the JG. The intention of the Guarantee label is a sufficient supply of jobs to ensure that both employer and employee are satisfied with the exchange. That being said, I have to say that I agree that I haven’t seen too much on this forum about how to protect a “Job Guarantee” from system capture of the sort that concerns you. Bill’s papers on JG administration are too detailed to be accessible to me, but I understand the intention is to entrust local government to the task. Probably work fine until the carpetbaggers notice the new source of public largess and start using their smart word play to turn all the money and effort to their exclusive benefit. Nevertheless, getting paid “minimum wage” to clean councilor’s houses is probably still better than being paid “welfare” to sit in your room and be ignored. It means some small recognition of your value and more money in everyone’s pocket to maybe pay you to “beautify” unsightly walls or “entertain” passing commuters instead. A job guarantee would make a lot more sense to me in the context of a society with existing universal healthcare and three years of universal kindergarten. In addition to student grants instead of student loans for post-secondary education. E.g. Scandinavia. Also, from my anecdotal experience, landscaper maintenance and cleaning were not undignified or unfulfilling jobs. To me, a demeaning job is one that pays under $40,000/yr for the same company where the CEO makes over $30 million/yr. A job guarantee is old paradigm thinking. However, a job guarantee would fit seamlessly within the new more generally problem resolving monetary and economic paradigm of Direct and Reciprocal Gifting for anyone who was having trouble finding purpose without putting in a 30-40 hr week of employment. The set of positive, constructive purposes is vastly larger than the set of employment as purpose. marcel:People who have become superfluous to the requirements of business and commerce, should be given ample opportunity to decide for themselves what to do with their vitality and not be destined to clean streets unless for a competitive commercial wages that are fully sustainable. Well, then you should support the MMT Job Guarantee, which is a universal offer of a job at “competitive commercial wages that are fully sustainable”. What you are talking about is workfare, which is not the same thing as a Job Guarantee. The MMTers have written a lot about the difference and are well aware of the literature you seem to be referring to. The JG is all about letting people decide for themselves what they are going to do, and getting paid a decent, living wage for it. The UBI emphatically is not – it is about top down administration forced on the ordinary person. Many people get this backwards until they look at the logic of it and at historical examples. Which is behind the truth that the economics of the JG work fine, and would improve any society, while those of the UBI do not, as a real UBI would quickly wreck the economy of any society and then be abandoned. More about the UBI later – people don’t seem to know the most damning critique of this idea from a century-odd ago, written by one of the world’s greatest artists. No, to either, but Job Guarantee programs would and did support people to put “art on a wall.” If other people can see and respect your poems as real poems, the Job Guarantee can publish them. And it would support cleaning hospital wards and parking lots too, some times and places. The idea is to fit the job to the person. For example, let’s see how it would work. Take a person, let’s call him, ohh “Bill Mitchell”. The JG program would put him to work at writing economics, or maybe playing music. I predict that they would not make him work as a poet. Either because he doesn’t really have the aptitude or inclination, or because they would look at his work above and tell him that it is a masterpiece which can not be duplicated – and which makes everybody else’s work look bad – and he would be miserable trying to reattain his past glory. There are many, many successful models of the JG idea the whole world over. The largest scale and most extensive one closest to the JG conception were FDR’s New Deal work programs. As people explain in the comments to Bill’s next post, they employed many as artists, writers, historians, poets, actors and ballerinas. And basically any other job you can think of. Job Guarantee are a great idea, but the entire thinking of money and economics have to be changed if it shall work. The present day politicians and administrators are so deeply entrenched in the faux logic that the state are like a household that it is hard to see them administer a JG in the right way. They would pretty soon in reality make it a work-fare system? The devil is in the details. It is easy to imagine a job guarantee funded by the government, but the problem arises when we start looking about for a supply of guaranteed jobs. Private and local government employers will tend to replace regular employees with recipients of guaranteed jobs, which of course defeats the purpose of the program. The last thing we would want is for JG recipients to compete with existing employees. One solution is to create a special federal agency to initiate new projects and take applications from state & local governments for proposed projects. Make JG recipients federal employees with a special wage scale but with full medical & disability benefits and maybe some kind of retirement credit. Something like an updated WPA. There are a number of other problems that would be encountered with implementation of a JG, but it seems to me that the JG will have the fewest. We have been working on this stuff for 25 years together and I have been thinking of it since 1978. There is an extensive literature on all the ‘problems’ that might arise with a Job Guarantee. The so-called “devil” in your comment just tells me you are making statements without reading that literature. All these things have been considered in depth.